There’s more to Kilburn than Kilburn High Road. Check out this year’s Kilburn Festival on Sunday 10 July.The annual festival pops up in Kilburn Grange Park with food stalls, a tea party, kid’s activities including martial arts and the festival’s traditional ‘Kilburn Beach’ (we’re as curious as you are about that one). There will be live music from the main stage all day and the programme looks intriguing and fun: there’s hip hop, soul, traditional Irish folk, country bluegrass and swing pop performers on the roster. Closing it out is ‘Thrill the World’, who will take over the super-sized dance floor with a mob rendition of the ‘Thriller’ routine. They will also run lessons throughout the day so that you’ve got your moves ready in time for the big finale. 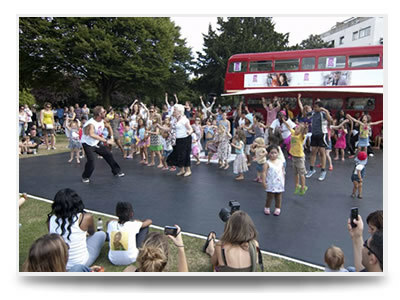 If the dance mob isn’t your thing, there are concurrent festivals in Kilburn, starting on Wednesday 6 July. The Kilburn History Festival is hosting talks on the neighbourhood's history, development and famous residents throughout the week. Did you know that AA Milne was born in Kilburn? On Sunday 10 July, join local historians for free guided tours of the High Road, one of Britain’s oldest roads. Kilburn Festival, Sunday 10 July, 1pm to 7pm, Kilburn Grange Park, NW6.